Heat the Airfryer to 200C for 3 minutes. Mix breadcrumbs, salt, pepper and parsley in a bowl. Cut the fish into 4 long pieces almost like big fish fingers. Whisk the eggs and place them on a plate, tip the flour on to another plate and the breadcrumb mix on to a third. Dip each piece of fish in the flour, then the egg, and then the breadcrumbs. Repeat so the fish is double-coated for extra crispiness. Then place in the Airfryer and cook for about 15 minutes or until golden. Cover in foil to keep warm while you cook the chips. Or, if you use the Airfryer XL, you can do both at once. Pat the chips dry with a paper towel. Shake in oil and place in Airfryer for 20 minutes until golden, shaking twice during cooking. Season. Heat the Airfryer to 200C for 3 minutes. Add the pepper, courgettes, aubergine, onion and oil and roast for around 20 minutes — until the skin of the veg has blistered — shaking the pan twice during cooking. Remove and leave to cool, turning the Airfryer down to 180C. In a saucepan, mix the veg with the rest of the ratatouille ingredients and bring to a simmer before seasoning. Add the sausages to the Airfryer, ensuring they aren’t touching each other, and cook for 10-15 minutes (depending on size), shaking once during the cooking time. Place the buttermilk, cayenne and garlic in a bowl with the chicken breasts, cover and place in the fridge to marinate overnight. Heat the Airfryer for 3 minutes. When you are ready to cook, rub as much of the marinade off the chicken as you can, then dip the breasts into a bowl of seasoned flour, then a bowl of beaten egg and finally the breadcrumbs, making sure that the chicken is well coated. Place the chicken in the Airfryer and fry for 20 minutes at 190C or until cooked through. 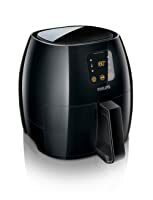 Allow to rest while you cook the chips (or use the Airfryer XL to fry both at the same time). Toss the chips in oil and paprika, then place in the Airfryer and cook at 190C for 20 minutes, shaking them twice in between. Once cooked, season the chips with salt and pepper. For the dal, sweat the onion, garlic, chilli and ginger in the oil in a pan for 10 minutes. Turn the heat up and add the curry leaves, turmeric, garam masala and mustard seeds. Fry for a minute then add the lentils. Stir so everything is evenly coated, then add the tomatoes and coconut. Season, then cover and simmer for 40 minutes or until the lentils are tender. Add more water if the pan gets a little dry or you want to create a soupier dal. Make the raita. Cut the watery seed core out of the cucumber and finely dice the flesh. Add the lemon juice, mint and cucumber to the yoghurt with a good pinch of salt, then stir. To create the bhaji mix, add the flour to a large bowl and pour in enough water to make a paste as thick as double cream. Toast the cumin, turmeric and fennel in a frying pan for a minute and add these to the flour mix with the salt, chilli, ginger and garlic. Heat the Airfryer to 180C. Stir the lemon juice, coriander and onions in the bhaji mix until they are coated. With wet hands, create bhaji balls the size of large olives, flatten slightly then add to the basket. Fry for no more than 10 minutes, until golden and crisp. Serve with the dal and raita on the side. Rub the salmon with the oil and season with salt and pepper. Place in the Airfryer for 10 minutes at 180C until the skin turns lovely and crisp. Meanwhile, prepare the courgette by using a spiralizer or julienne peeler on the courgettes, then set to one side. To make the sauce, place the avocado, garlic, parsley and some seasoning in a mini chopper or food processor and blend until smooth. Chop the tomatoes and olives, then set to one side. Toss the courgette in the sauce, divide between two plates, along with the tomatoes and olives, and top with the salmon. To serve, scatter the pine nuts over the dish. Heat the Airfryer to 240C. Using a peeler, shave super-thin strips off the parsnips, beetroot and sweet potato. Toss the vegetable slices in the oil and chilli powder or herbs, then season with salt and pepper. Cook in the Airfryer for 20 minutes or until golden and crisp, shaking the pan halfway through. For the cheesy pesto twists, roll the pastry into a rectangle on a lightly floured surface with the long side vertical and the short side horizontal. Cut in half down the middle. Spread cream cheese and pesto over one half, then place the other piece of pastry on top to create a sandwich. Cut in half down the middle again to create 2 long rectangles. Slice each rectangle into 1cm-thick strips horizontally. Twist each pastry strip, pulling gently to lengthen. Once you have all your twists, brush lightly with beaten egg and scatter with Parmesan. Airfry for 20-25 minutes or until risen and golden brown. Both snacks can be served warm or cold. Heat the Airfryer to maximum temperature for a few minutes while you prepare the beef. Rub with oil, salt and pepper, and roast for 30 minutes, turning the temperature down to 190C after 10 minutes. This will give you medium rare meat, ideal for this dish. While the meat is roasting prepare the salad: toss all ingredients together and set aside. For the nam jim dressing, put all the ingredients into a food processor and blitz for a minute or so. The dressing should be well combined and thin. Drizzle some over the salad and put the rest in a small serving bowl so guests can help themselves. Once the beef is roasted allow it to rest for about 20 minutes so it’s super-juicy, then cut into wafer-thin slices. To serve, pile salad on to a plate and top with thin slices of beef. Garnish with coriander, toasted peanuts and lime wedges. Peel the potatoes and cut into roughly rectangular blocks. Slice into long fries, no more than 1cm thick. Soak the fries in a bowl of cold, salted water for 30 minutes. Drain and pat dry with kitchen paper then toss with the olive oil. Heat the Airfryer to 160C. Place the fries in the basket and cook for 15 minutes. Heat the Airfryer to 200C for three minutes. Pat the lamb dry with a kitchen towel, then score the fat with a sharp knife to encourage it to drip out of the meat. This is how the calories are reduced. Rub the scores with the mustard. Blitz the breadcrumbs with the herbs, Parmesan, lemon zest and seasoning and, using the mustard as the ‘glue’, roll the fat of the rack through this mixture to form the crust. Season the rest of the joint, then add to the Airfryer with the oil and roast for 15 minutes until the crust is golden and the lamb cooked. If you like your lamb well done, cook for a further 5-10 minutes. For the wedges, peel and core the pumpkin and coat lightly in oil. Season and set aside. Remove the lamb and rest on a plate, then add the wedges to the Airfryer in a single layer, roast for around 20 minutes or until crisp, golden and cooked through. Serve with the lamb and a simple green salad. Heat the Airfryer to 200C for a few minutes while you prepare the chicken. Mix the paprika, honey, salt and pepper and garlic powder in a small bowl. Score the skin of the chicken and rub the paprika mix in thoroughly. Because you’re airfrying you will need little or no oil. Airfry for 35 minutes until the juices run clear. The skin should be crisp and bubbling. Rest the chicken on a foil-covered plate while you cook the rosti. For the rosti, drain the grated sweet potato of water in kitchen towel so it’s completely dry before mixing it together with cabbage, egg, salt and pepper, flour and parsley into a bowl. Shape into two large or four small rosti and brush with olive oil – again, just the tiniest amount – about half a tablespoon. Airfry the rosti for 8 minutes, turning once through cooking until golden brown on both sides and cooked through. Remove it from the pan and serve with the chicken and a light tomato salad. Heat the Airfryer to 200C. Put the mushrooms, tomatoes and garlic in a round tin. Season and spray with oil. Place the tin, bacon and chipolatas in the cooking basket. Cook for 10 minutes. Heat the oil in a frying pan, then season and cook the onion, stirring over a medium heat until softened. Heat the Airfryer to 160C. Whisk the eggs in a bowl, add the crème fraîche and horseradish. Tip the onion into a 17cm dish and add the egg mix and trout. Place dish in cooking basket and cook for 20 minutes or until the frittata is set and golden. Scatter with dill. Heat the Airfryer to 200C. Heat the Airfryer to 180C. Beat the eggs with the vanilla, and butter both sides of the bread. Soak the bread in the egg mix until it is all absorbed. Place the bread directly in the fryer basket and cook for six minutes, turning halfway through. Serve with mixed berries, yoghurt and honey to taste. Place all the ingredients except the coriander and sesame seeds in a freezer bag. Seal and massage the drumsticks to ensure they are well coated. Leave in the fridge overnight to marinate. Heat the Airfryer to 200C. Place the drumsticks in the basket of the fryer and cook for 10 minutes. Lower the heat to 160C and cook for a further 10 minutes. Scatter with coriander and sesame seeds. Serve with rice and stir-fried bok choi. Slice the squash, remove the seeds, and cut into chunks. Place in a bowl with the spices and oil. Season well. Heat the Airfryer to 190C. Place the squash in the basket and roast for 20 minutes, turning occasionally, until soft and slightly charred. Toast the nuts in a dry frying pan for two minutes, making sure they don’t. Serve the squash with yoghurt and the nuts and coriander sprinkled over. Heat the Airfryer to 180C. Place the fishcakes in the fryer basket, spray with oil and cook for 7 minutes or until golden. Core the apples and score skin around circumference with sharp knife to stop them from splitting. Combine all the remaining ingredients and carefully stuff the apple cores, scattering over any remaining mix. Bake at 180C for 10 minutes or until slightly collapsed. Heat the Airfryer to 180C. Cut a cross into the top of each fig and squeeze slightly to open out. Place in a heatproof dish and put a small knob of butter in each one. Drizzle over the honey and place the dish in the fryer basket. Cook for 5 minutes, or until the fruit has softened and the juices caramelised. Stir rosewater into the mascarpone. Place a dollop on each serving of figs and scatter the almonds over the top. Heat the Airfryer to 180C. Spray the fish loins with oil and season well. Place in the fryer basket and cook for 8-10 minutes or until flaky. Meanwhile, place the tomatoes and olives in a small saucepan with the oil and lemon juice. Warm through but do not boil. Season and add the basil and keep warm. Serve with the tomato vinaigrette, and some Airfryer-cooked fries (guilt-free at just 222 calories). Sandwich the chicken between clingfilm and beat with a rolling pin until ½ cm thick. Mix the breadcrumbs, parmesan and sage. Dredge the chicken in the seasoned flour, then dip into the egg and finally coat in the breadcrumbs. Heat the Airfryer to 200C. Spray the chicken with oil on both sides and place two at a time in the basket. Cook for 4 minutes or until golden and tender. Serve with a green salad. Combine the yoghurt, spices, lime juice and salt and coat the lamb chops. Leave to marinate for at least an hour. Heat the Airfryer to 200C. Place the chops in the fryer basket and cook for 10 minutes or until cooked to your liking. Oil and heat a wok. Add ginger, mushrooms and water chestnuts. Cook for 2 minutes, then add the soy sauce, five-spice powder, beansprouts, spring onions and carrot. Cook for 1 minute, then leave to cool. Add the prawns. Heat the Airfryer to 200C. Roll up mixture in wrappers, sealing with beaten egg. Brush each roll with oil. Cook in batches in fryer basket for 5 minutes. Serve with dipping sauce. Heat the Airfryer to 200C. Scrub the potatoes and dry with kitchen paper. Place in the fryer basket and cook for 25 minutes. Meanwhile, cook the asparagus in salted boiling water for 3 minutes till just tender. Allow the potatoes to cool slightly, then slice off the tops and scoop the flesh into a bowl. Combine with the crème fraiche, cottage cheese, mustard and asparagus. Season and refill the potato skins before serving. Peel the potatoes and cut them lengthwise into thin wedges. Soak in water for 30 minutes, then drain and pat dry with kitchen paper. Heat the Airfryer to 180C. Mix the paprika with the oil and coat the wedges before transferring to the fryer basket. Fry for 20 minutes, shaking the basket occasionally to turn the wedges. Place the chips on kitchen paper to soak up any excess oil, sprinkle with salt and serve with a dip made of yoghurt and hot chilli sauce. Wilt the spinach in the microwave or in boiling water for 30 seconds. Drain well, squeezing out all the moisture. Roughly chop and mix with the ricotta, nuts, lemon zest and egg. Season well. Cut each filo sheet into three strips. Place 1 tablespoon mixture in the top corner of each, and fold diagonally to form triangular parcels. Brush the parcels with oil, place them in the fryer basket and cook in batches for 4 minutes or until golden. Boil sprouts for about 4 minutes, plunge in cold water, drain and set aside in fridge to chill. Soak raisins in orange juice for about 20 minutes. 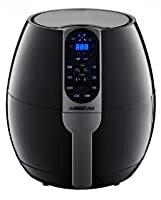 Heat Airfryer to 200C. Stir sprouts in oil and roast for about 15 minutes. Serve with raisins, pine nuts and orange zest. Place potatoes, garlic, rosemary and bacon in a bowl. Add oil and mix well. 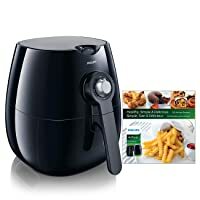 Heat Airfryer to 200C. Place everything in the basket and roast for 25-30 minutes, until golden brown. Drizzle the carrots with the oil. Add the cumin seeds and stir. Heat the Airfryer to 200C. Cook the carrots for 20 minutes, until lightly browned and tender. Scatter with chopped coriander. Place all ingredients in food processor and blitz to for dough. Roll into a log shape, 2-3cm in diameter. Wrap in clingfilm and freeze for about 30 minutes. Line Airfryer basket with baking parchment and heat to 180C. Slice dough into 1cm rounds and cook for 15 minutes, until golden. Place pastry on floured work surface. Smear with mustard, add ham and sprinkle cheese over the top. Roll up pastry, starting at the short edge. Wrap in clingfilm and freeze for about 30 minutes until firm. Line Airfryer basket with baking parchment and preheat to 190C. Slice pastry into 1cm rounds and cook for 10 minutes, until golden. Prick each sausage with fork. Cut rashers in half and wrap around. Heat Airfryer to 180C and cook for 10 minutes, shaking halfway. About 2 tbsp oil should drain away during Airfryer cooking. – Place into a pre-heated Airfryer on 200 degrees for 8-18 mins. – Shake once during cooking. TIPS Chicken can be marinated or filled with stuffing if desired. 1. Clean the potatoes by scrubbing under running water. 2. Fill a medium-sized pot with water and over medium-high heat, bring water to a boil. 3. Add the potatoes to the boiling water. 4. Once cooked through (approximately 20-30 minutes), remove from water and cool completely in refrigerator for about 30 minutes. 6. In a mixing bowl, combine canola oil, paprika, salt and black pepper. 7. Preheat the Airfryer to 390˚F. 8. Lightly toss the potatoes into the oil mixture. 9. Place half of the potatoes into the Airfryer skin side down. Don’t overcrowd. 10. Cook each batch for 6-8 minutes, shaking halfway through. 1. Peel the potatoes and cut them into strips (1/2 inch x 3 inch). 2. Soak the potatoes in water for at least 30 minutes. Then drain the potatoes thoroughly and pat them dry with paper towels. 3. Preheat the Airfryer to 320˚F. 4. Carefully coat the fries in oil and transfer to the fryer basket. Cook for 5 minutes, until crisp. Allow to cool. 5. 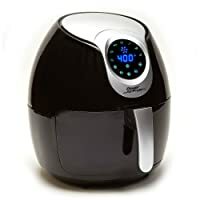 Increase the Airfryer temperature to 390˚F. 6. Slide the basket of pre-cooked fries back into the Airfryer and cook for 10-15 minutes or until golden brown. 1. Preheat the Airfryer to 390°F. 2. Cut eggplant to 10 mm X 3 in. 3. In a mixing bowl combine cornstarch, olive oil, water, and eggplant. Mix and coat eggplant evenly. 4. Place half of eggplant fries into the Airfryer. Cook for 12-14 minutes or until eggplant start to brown. 5. Repeat the process until all eggplant fries are cooked. 2. Cut zucchini to 10 mm X 3 in. 3. In a mixing bowl mix cornstarch, olive oil, water, and zucchini. Mix and coat zucchini evenly. 4. Place half of zucchini fries into the Airfryer. Cook for 12-14 minutes or until zucchini start to brown. 5. Repeat the process until all zucchini fries are cooked. 2. Peel, cut parsnips to 10 mm X 3 in. 3. In a mixing bowl mix cornstarch, olive oil, water, and parsnips. Mix and coat parsnips evenly. 4. Place half of parsnip fries into the Airfryer. Cook for 12-14 minutes or until parsnips start to brown. 1. Boil the potato cubes in salted water for 15 minutes. 2. Drain the potatoes and mass finely with a potato masher or ricer. Cool completely. 3. Add the egg yolk, cheese, flour and chives to the potato. 4. Season to taste with salt, pepper and nutmeg. 6. Place each potato ball into the flour, then the eggs and then the breadcrumbs and roll into a cylinder shape. 7. Preheat the Airfryer to 390F. 8. Place half of the croquettes into the Airfryer basket and cook for 7-8 minutes or until golden brown. 2. Take 1 head of garlic, cut the topside off. Placed into aluminum foil with 1 tbsp olive oil, salt, and cook for 20 minutes. When finished cool and set aside. 3. Scrub potatoes under running water. 4. On a clean cutting board cut potatoes lengthwise. 5. Now with a peeler peel potato strips right into a mixing bowl full of water. 6. Soak potatoes for 30 minutes; change the water several times. 7. Preheat the Airfryer to 320°F. 8. In a mixing bowl toss potato strips with remaining olive oil. Place chips into fry basket. 9. Set the timer for 28 to 30 minutes. Cook until golden brown. 10. While chips are cooking combine sour cream, roasted garlic, ½ tbsp chopped rosemary, & salt. 11. Finish the potato chips with remaining ½ tbsp chopped rosemary and salt. TIP: The key to the perfect chip is to frequently shake the basket threw out the cooking process. 1. Peel sweet potatoes and cut into (½ inch X 2 ½ inch) long fries. 2. Soak in water for 10 minutes. 3. Preheat the Airfryer to 390°F. 4. Drain the sweet potato fries well and pat dry with a paper towel. 5. Transfer fries to a mixing bowl, combine cornstarch, canola oil and water. 6. Place 1/3 of the fries into the Airfryer basket and cook for 10 to 12 minutes. Shake the fry basket a couple times for even cooking. 7. Repeat the process until all the fries are cooked. 4. Mix pecans, 2 tsp oil and ¼ tsp salt. Place into fry basket, cook for 1 to 2 minutes. Then cool and set aside. 5. Drain the sweet potato fries well andpat dry with a paper towel. 6. Transfer fries to a mixing bowl, combine cornstarch, canola oil, water and powdered sugar. 7. Place 1/3 of the fries into the Airfryer basket and cook for 10 to 12 minutes. Shake the fry basket a couple times for even cooking. 8. Repeat the process until all the fries are cooked. 2. In a mixing bowl toss pine nuts with 1 tsp olive oil. 3. Place pine nuts in the Airfryer, cook for 1-2 minutes. Remove, cool, and set aside. 4. Place golden raisins in a bowl and pour 1 cup of boiling water over and set aside. 5. Place the head of cauliflower on a clean cutting. Using a chef ’s knife core the head of cauliflower. 6. Cut florets of cauliflower ; into 1 inch pieces. 7. In a mixing bowl combine cauliflower, olive oil, curry, and salt. 8. Place half the florets into the Airfryer. 9. Cook for 8-10 minutes. 10. Repeat the process till all florets are cooked. 11. Drain the golden raisins into a strainer. 1. Take the bacon out of the refrigerator and let it sit out at room temp for 30 minutes. 2. Preheat the Airfryer to 390°F. 3. Gather the peeled and deveined tiger prawns and the tempered bacon. Take one slice of bacon and wrap it around the tiger prawn. Start from the head of the prawn wrapping the whole prawn to the tail. 4. Place the wrapped tiger prawns back into the refrigerator for 20 minutes. 5. After 20 minutes in the refrigerator place half of the tiger prawns into the Airfryer and cook for 5-7 minutes. 1. Take the bacon out of the refrigerator and let set for 30 minutes. approximately 1-inch x 1.75-inch each. 3. Once the bacon is at room temperature, take two pieces of bacon and wrap around each piece of cheddar, fully enclosing the cheese. Trim any excess fat. 4. Place in the freezer for 5 minutes to firm. Do not freeze. 5. Preheat the Airfryer to 390F. 6. Mix breadcrumbs together with salt and olive oil. 7. Gather eggs, flour and breadcrumbs and set aside in 3 bowls. 8. Remove cheddar blocks from the freezer. One at a time, place into the flour, then the eggs and finally the breadcrumbs. 9. Place the croquettes in the Airfryer and cook for 7-8 minutes or until golden brown and cheese begins to ooze. 1. In a small pot over medium-high heat mix olive oil, onions, peppers, and celery. Cook and sweat until translucent. About 4-5 minutes. Remove from heat and cool. Set aside. 2. In a mixing bowl combine all ingredients. 4. In a food processor blend the panko breadcrumbs and salt to a fine crumb. 5. In three separate bowls, set aside eggs, panko, and flour. 6. Mold crab mixture to the size of golf balls. 7. Place each ball in the flour, then into the eggs, and last the panko. 8. Cook half the crab croquettes for 8-10 minutes in the Airfryer. Don’t overcrowd. 9. Repeat the process till all crab croquettes are cooked and golden brown. 10. Serve with tarragon remoulade. 1. In a mixing bowl combine all the ingredients in the Jerk seasoning, including the chicken wings. 2. Transfer to a 1 gallon re-sealable bag and refrigerate for 2 hours up to 24 hours. 3. Preheat the Airfryer to 390F. 4. Transfer the chicken wings to a fine mesh strainer to drain any additional liquid. 5. Place half the wings in the Airfryer basket and cook for 14-16 minutes, shaking halfway through. 6. Repeat to cook the remaining wings. of paper towels and dry. 5. Place in the freezer for 5 minutes to firm. minutes or until dough is golden brown. 4. In the Airfryer place half the meatballs into the fry basket. Cook for 6-8 minutes. 5. While the meatballs are cooking combine all ingredients for the mint yogurt in a mixing bowl and mix. 1. Combine all ingredients except for the chicken. 2. Skewer each chicken tender, trimming excess meat or fat from the skewer. 3. Combine the marinade and the chicken and refrigerate, covered, for 2 hours up to 24 hours. 4. Preheat the Airfryer to 390˚F. 5. Add half of the skewers to the Airfryer basket and cook for 5-7 minutes. 1. In a sauce pan combine all ingredients for the teriyaki glaze/marinade. 2. Bring to a boil and reduce by half, then cool. 3. Once cooled add half of the glaze/marinade into a resealable bag with the halibut. 5. Preheat the Airfryer to 390°F. 6. Place marinated halibut into the Airfryer and cook for 9-11 minutes. 7. When finished brush a little of the remaining glaze over the halibut steak. 2. In a mixing bowl combine pine nuts, 1 tsp olive oil, and pinch of salt. 3. Toss pine nuts into the Airfryer and set timer for 1-2 minutes. Remove and place onto a paper towel and set aside. 4. Make the pesto. Wash and rough chop one bunch of parsley and one bunch of basil. 5. In a food processor, add chopped parsley, basil, fresh grated parmesan, garlic, toasted pine nuts and salt. Turn on the food processor and drizzle in the olive oil. 6. Once all the olive oil is incorporated stop the food processor and remove the pesto and refrigerate. 7. Slice the tomato into ½ inch thick slices. Also slice the feta into ½ inch thick slices. 8. Next take a circle cutter and cut the feta the same size as the heirloom tomato. 9. Stack the feta on top of the tomato. In between the tomato and feta spread 1 Tbsp basil pesto. Then slice the red onions paper thin and toss with 1 Tbsp olive oil and apply to the top of the feta. 10. Place tomatoes into the Airfryer and cook for 12-14 minutes or until the feta starts to soften and brown. 11. Finish with sea salt and basil pesto. 1. Combine all ingredients, except the steak, in a mixing bowl. 2. Cut the steak into 2 8-ounce portions. 3. In a re-sealable bag, add ¼ cup of chimichurri mixture and the steak. Refrigerate for 2 hours up to 24 hours. 4. One steak is marinated, remove from refrigerator and let sit at room temperature 30 minutes prior to cooking. 5. Preheat the Airfryer to 390˚F. 6. Add steak to the Airfryer and cook 8-10 minutes for medium-rare. 1. Preheat the Airfryer to 320°F. 2. Scoop out the middle of the portabella cap with a spoon; Clean it well and be careful not to break the cap. 3. Drizzle olive oil on both sides of the portabella. 4. Season the inside of the portabella with salt and Italian seasonings. 5. Spread crushed tomatoes evenly around. 6. Next spread the shredded mozzarella evenly around the portabella. 7. Place the portabella pizza into the Airfryer and cook for 4 to 6 minutes. 8. After 1 minute place the pepperoni slices on top of the melted cheese. 9. Finish with fresh grated parmesan and crushed red pepper flakes. 1. Peel and slice half a red onion into ¼ inch thin slices. 2. Wash button mushrooms; then into slice ¼ inch thin slices. 3. In a sauté pan with olive oil sweat onions and mushrooms under a medium flame until tender. 4. Take onions and mushrooms off the heat and place on a dry kitchen towel to cool. 5. 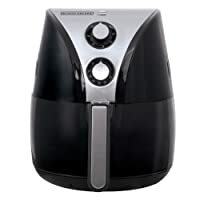 Preheat Airfryer to 320°F. 6. In a mixing bowl crack 3 eggs, then whisk the eggs thoroughly and vigorously. 7. In a 6 ounce ramekin coat the outside and bottom with a light coating of pan spray. 8. Pour eggs into the ramekin, next ¼ cup onion and mushrooms mixture, and then the cheese. 9. Place ramekin into the Airfryer. and cook for 10 to 12 minutes. 1. Place the whole Cornish hen on cutting board. Using a boning knife or a chef ’s knife. Set the Cornish hen upright with the back of the hen facing you. Start from the top of the back bone to the bottom of the back bone. Make 2 cuts and remove the back bone. 2. Once the back bone is removed split the hen lengthwise cutting threw the breastplate. Now that you have 2 whole halves of Cornish hens set aside. 3. In a mixing bowl combine all ingredients for the marinade including the Cornish hens. Refrigerate for 1 hour up to 24 hours. 4. Preheat the Airfryer to 390°F. 5. Transfer the Cornish hens to a fine mesh strainer to drain off any additional liquid. 1. Preheat the Airfryer to 285°F. 2. Pour 1 cup of water in the bottom of the Airfryer. 3. Take the two 6 oz portions of salmon and drizzle 1 tsp of olive oil over each piece. 5. Place both portions of salmon into the Airfryer and cook for 9-11 minutes. 6. While the salmon is cooking in a mixing bowl combine the yogurt, sour cream, chopped dill and salt. Leave a pinch of chopped dill as a garnish for the top of the salmon. 1. In a mixing bowl combine all ingredients for the pork chop marinade. 2. Transfer to a re-sealable bag and refrigerate for 2-3 hours. 5. Place jalapenos in the Airfryer and cook for 5-7 minutes. When done place the jalapenos back into the mixing bowl. Cover and set aside. 6. Once the jalapenos have cooled; peel, seed and finely chop them for the salsa. 7. Chop the cilantro, parsley, pineapple, and tomato. Combine all ingredients for the salsa and set aside. 8. Take the pork chops out of the refrigerator and let sit at room temp for 30 minutes prior to cooking. 9. Reheat the Airfryer to 390°F. 1. In a mixing bowl, combine all ingredients for Cajun Shrimp: prawns, spices, seasoning, olive oil and salt. Set aside. 2. Make Jambalaya Rice. In a small pot over medium-high heat add olive oil, red onions, celery, jalapenos and salt. Cook for 4-5 minutes covered, until the vegetables are translucent. 3. Add rice, seasonings and chicken stock to the pot. Cover and bring to a boil. Once at a boil, turn the heat down to low and cook for 15 more minutes. 4. Preheat the Airfryer to 390F. 5. Add the tiger prawns to the basket and cook for 4-5 minutes. 6. Serve the prawns on top of the rice. 1. Preheat the Airfryer to 390F. 2. Gather the eggs, flour and breadcrumbs into three separate bowls. 3. Add salt and olive oil to the breadcrumbs bowl and mix well. 4. Cut the piece of cod into strips approximately 1-inch x 2.5-inches. Each nugget should be about ½ inch thick. 5. Place the nuggets into the flour, then the eggs and finally into the breadcrumbs. 6. Press the breadcrumbs down on the nuggets down to ensure they stick and cook evenly. 7. Shake off any excess breadcrumbs. 2. Gather beaten eggs, flour, and breadcrumbs into three separate bowls. Season the breadcrumbs with salt, black pepper, and olive oil. 3. Mix the breadcrumbs and olive oil well. 4. Place the chicken tenders into the flour, then the eggs, and finally into the breadcrumbs. Only coat 4-5 chicken tenders at a time. 5. Press chicken tenders down with some force to ensure even coating of the breadcrumbs. 6. Shake off any excess. Place on a sheet tray and set aside till all tenders have been breaded. 7. Open the Airfryer and put half the tenders into the fry basket. Don’t overcrowd. 8. Cook for 10-12 minutes. Shake the basket half way through the cooking process, to ensure even cooking. 1. 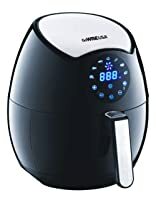 Preheat the Airfryer to 355°F. 2. Measure out cheese and butter in separate bowls. 3. Brush the butter between the 4 slices of bread. 4. Equally distribute the cheese on 1 side of 2 pieces of bread. 5. Put the grilled cheese together and place into the Airfryer for 4-5 minutes or until golden brown and the cheese is melted. 2. Form ground beef into 2 4-ounce patties. Season with salt and pepper. 3. Place the cheeseburgers into the fry basket, and cook for 10 to 12 minutes. Add the cheese at the last minute to melt. 1. Preheat the Airfryer to 355˚F. 2. Brush 1 sheet of filo with butter. Fit a second sheet of filo on top of the first and also brush with butter. Repeat until you have used all 4 sheets. 3. Cut filo into 4 3-inch x 12-inch strips. 4. Place 1 Tbsp of peanut butter and 1 tsp marshmallow fluff on the underside of a strip of filo. 5. Fold the tip of the sheet over the filling to form a triangle and fold repeatedly in a zigzag manner until the filling is fully wrapped. Use a touch of butter to seal the ends of the turnover. 6. Place the turnovers into the Airfryer basket and cook for 3-5 minutes, until golden brown and puffy. 7. Finish with a touch of sea salt for a sweet and salty combination. 1. Lightly coat 4 4-ounce ramekins or 1 6-inch round cake pan with vegetable spray. 2. Preheat the Airfyer to 320°F. 3. Bring 2 cups over of water up to a boil and pour into preheated Airfryer. 2. In a small pot add the sugar and 1.5 Tbsp water together. Cook over medium-high heat, swirling the pan constantly, until the sugar turns a rich amber color, about 10 minutes. 3. Immediately pour 1 to 2 Tbsp of the caramel into the bottom of each cup. 4. In a mixing bowl, blend the 3 milks with a wire whisk adding the eggs and egg yolks last. 5. Once well blended ladle the custard base into the ramekins one at a time. 6. Cover each ramekin with aluminum foil and bake for 30 minutes in the Airfryer. 7. Remove the ramekins and uncover, place into the refrigerator for 2 hours to set completely. 8. In a conventional oven preheat 350°F. On a sheet tray place the coconut flakes evenly around and toasted for 5-7 minutes, or until lightly browned. 1. Mix the flour and butter until it is a smooth paste. 2. In a sauce pot heat milk and dissolve the sugar. Bring to a boil. 3. Add the flour and butter mixture to the boiling milk. With a wire whisk, beat vigorously to ensure there are no lumps. 4. Simmer for several minutes until the mix thickens. Remove from the heat and cool for 10 minutes in an ice bath. 6. In another mixing bowl quickly beat the egg yolks and vanilla extract/bean and combine with cooling milk mixture. 7. Seperately beat the egg whites, sugar, and cream of tartar until the egg whites form medium stiff peaks. 8. Fold the egg whites into the soufflé base and pour into the prepared baking dishes and smooth off the tops. 9. Preheat the Airfryer to 320°F. 10. Place 2 to 3 soufflé dishes into the Airfryer. Cook for 12-15 minutes. Soak the potato strips in a bowl of water for 20 minutes, then drain and pat dry with paper towel. Place the potatoes in a large mixing bowl, and stir in olive oil, sea salt, thyme and oregana. Make sure potatoes are coated and seasoned well. And the seasoned potatoes to the air fryer basket and cook at 350 degress for 20 minutes. Stir fries midway through cooking. Remove the basket when fries are crispy and golden brown. Lay all of the wrapped shrimp on a deep dish and squeeze the lemon to cover with juice. Add garlic salt. For tomato mixture, chop fresh tomatoes and place them in a medium bowl. Add olive oil and mix in salt, oregano, inced garlic, and basil leaves. Mix well and set aside. Slice the baguette into 1 inch slices. Place a slice of fresh mozzarella on each bread slice and place in air fryer basket. Bake at 370 degrees for 5 minutes until cheese has melted. Wash and peel Sweet potatoes. Slice into 1/2 inch thick potato strips. Place the potatoes in a large mixing bowl, and stir in olive oil, salt, black pepper, garlic salt and paprika. Add the seasoned sweet potatoes to the air fryer basket and cook at 370 degrees for 20 minutes. Stir fried midway through cooking. Begin by making the butter mix- Heat butter over stove or melt in microwave to liquefy. Add in all spices and lemon juice and mix well. Place saimon fillets in frying basket, and with a pastry brush, coat salmon evenly with the butter mixture. Try cooking it with chipotle ranch topping. Cover the sandwich with the other slice of bread, coat with butter and place sandwich in basket. Blend/ Process Chipotle peppers in mayo, mix in garlic salt, and black pepper. Pour the mix into a medium bowl and stir in the tuna. Add cilantro and salt or pepper to taste. Coat the toast with butter, then spread the tuna onto the buttered slice of bread. Top with cheese and bread. Buffer the tob slice. Rmove the bsket when cheese has melted or when tost is golden. Spread a 1/2 cup of spagheti sauce onto a 7-inch pan. Place stuffed shells on pan, open side up. Spread the remaining sauce on top. Blend/Process the chipotle chiles to make a Chile paste. And a table spoon of the adobo sauce from the can. Add a pinch of salt, and fresh ground pepper to taste. Place drumsticks in fryer basket and cook at 320 degrees for 30 minutes. Turn the drumsticks midway through coooking and brush with leftover marinade. Peel and slice apples into small chunks and place in pot. In a separate bowl, combine sugars, cinnamon, and cornstarch and mix well. Place empandas in the air fryer basket and fry at 350 degreees for 15 minutes. Do not over fill basket when cooking. Remove when golden. Poor the crust mixture into the 7 inch pie pan adn press gently to flatten and evenly cover the base of the pan. Place in air fyrer for 5 minutes then remove and set aside to cool down. Place the pie pan in the air fryer basket and bake at 350 degrees for 40 minutes. Remove when golden. Allow to cool ompletely before serving. In a separated bowl, combine flour, sugar , cocoa powder, baking powder and salt. Peel and dice apples. Place apple chunks into a medium bowl, then cranberries, 1/2 cup of brown sugar, cinnamon, juice from lemon, and mix well. To make the crumble, use a large mixing bowl and add 1/2 cup of brown sugar, salt, flour and cinnamon. Mix in butter cubes and mash to make a consistent clumpy texture. Pour the apple mix into a baking dish and top with the crumble. Place the dish into the air fryer basket and bake at 350 degrees for 30 minutes.